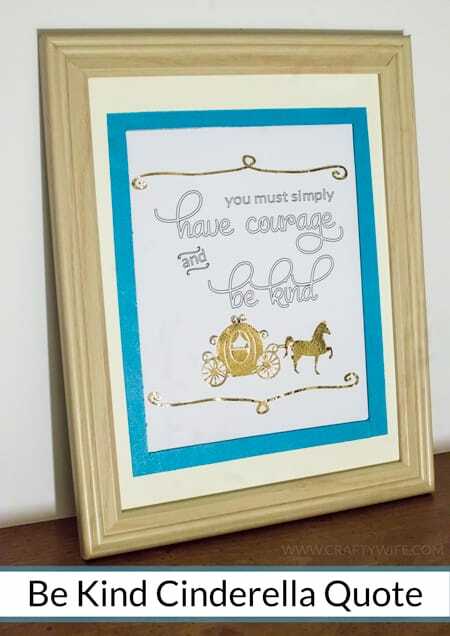 Throughout Disney’s newest live-action movie Cinderella, this mantra was quoted time and time again. Ever since we saw the movie Thursday night I haven’t been able to get this saying out of my head, and I’m sure poor Chris is tired of hearing me randomly quoting it in our every day conversations. But I loved it, can’t get over it, and wanted to make something that would be a constant reminder. As a young girl, I was never that big of a Cinderella fan. I loved the animated classic and would watch it occasionally, but never as much as I watched Beauty and the Beast or The Little Mermaid. I just never found Cinderella to be as relatable as some of the other Disney Princesses which made it not as enjoyable to watch. In Disney’s live action version, the bullying that Ella deals with throughout the film very much mirrors my own high school experience and therefore makes her a more relatable character for me. Dealing with those who took advantage of her kindness and generosity most certainly took its toll on her, but she never wavered from the core values that her parents taught her: to have courage and be kind. The positive impact Ella’s parents left behind was prominent throughout the story, and it truly goes to show that the way children see their parents behave is what they will mimic as they grow older. Ella embodied grace, dignity, and kindness, all things her parents thought were important traits to pass on to their child. Poor Anastasia and Drisella had a mother who only cared about her status in the world and was neither nurturing or kind, how could they turn out any differently with that kind of example? This film truly shows us how our actions impact and influence those around us, and is a constant but gentle reminder to always be aware of that. Okay, I know y’all are dying to know how to make your own Cinderella quote. To be honest, all you need to do is download the Silhouette files! It really is that simple. I divided everything up into three separate files in case you wanted to use multiple colors for the different elements of the file. Hopefully that makes it a little easier for you! For reference, this file fits on an 8×10 piece of paper and inside an 11×14 picture frame. 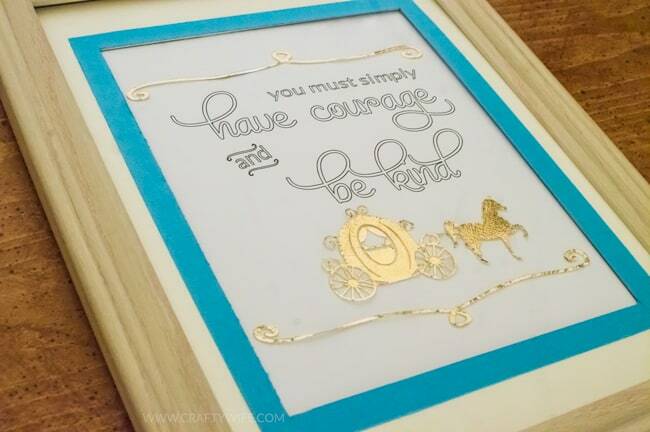 I used a sketch pen for the quote and then used gold foiled cardstock for the carriage and the flourishes. I also wanted to add a bit of color and found a beautiful blue piece of cardstock to add a border to the picture frame mat. I absolutely love how this turned out. When the gold of the carriage catches the light during the day it draws your eye right to it. I’m so happy to have this displayed in our home! That’s so pretty and would make a wonderful gift ! I love the gold detail on the carriage. Via the CBN. Thank you so much! 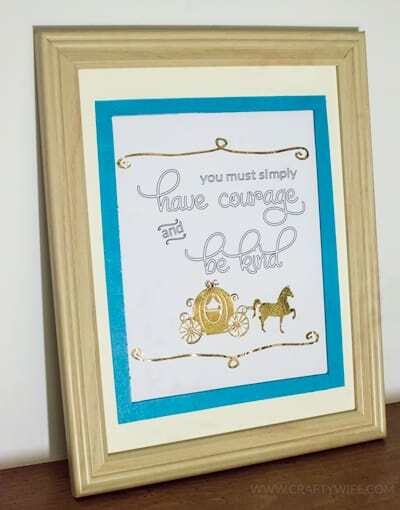 I agree, I think this would make a great gift or it would look so pretty in a little girl’s nursery! LOVE this printable! Pinning and sharing everywhere! The movie was FABULOUS! I laughed, cried, had chill bumps, and believe in happily ever after all over again!! I love this quote, searched & found this which led to your blog on pinterst! Unfortunately, I am having trouble downloading the images. Hi Lori! Sorry about that, the files should be fixed and you should be able to download them now! Thank you for letting me know! This is so elegant! Well done. Pinned and following on G+. I really would like to buy. It’s cute, amazing. Congrats! This is lovely – thank you for sharing.